Toni Gonzaga and Paul Soriano are engaged! Toni Gonzaga and Paul Soriano cap their relationship of seven-and-a-half years with their much-awaited engagement. It’s only the first day of February, and the love month is already brimming with romance! Today on ABS-CBN's The Buzz, long-time couple Paul Soriano and Toni Gonzaga formally announced their engagement. Kris Aquino was in tears while the couple related their engagement and love story. Toni and Sandy are co-stars in the ABS-CBN comedy series Home Sweetie Home. 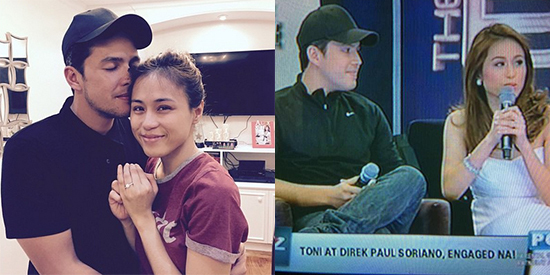 Read: Are Toni Gonzaga and Paul Soriano engaged? However, a couple of days later, Sandy Andolong posted a photo on her Instagram and apologized to Toni for calling her a loving fiancée, saying she just based it on the fact that Toni and Paul have been in a very stable and God-centered relationship for years, and that she thought fiancée sounded more appropriate and romantic than girlfriend. Read: Sandy Andolong apologizes to Toni Gonzaga for calling her a "loving fiancée"
Toni’s absence on The Buzz last January 25 also triggered speculations on her engagement to Paul. All those rumors can be laid to rest, as it is now official: Toni Gonzaga will soon be Mrs. Paul Soriano!